​Cost resources are defined as resources that let you apply a cost to a task by assigning a cost item (like a capital expenditure on equipment, or variable costs such as airfare or lodging) to that task. Cost resources are resources that don't depend on the amount of work on a task or the duration of a task, such as airfare or lodging. Unlike fixed costs, you can apply any number of cost resources to a single task, making different types of costs easier to see and track. 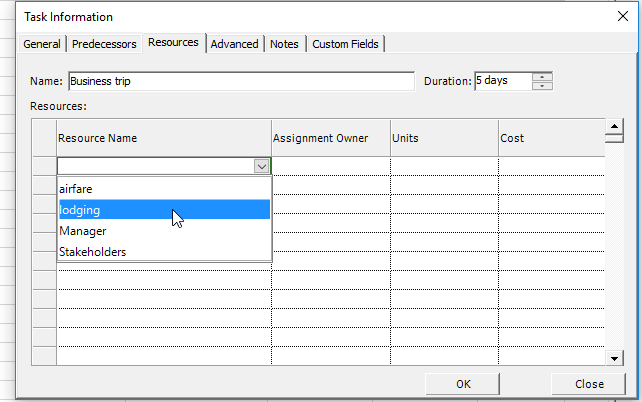 Moreover, you can assign the same cost resource to multiple tasks, even if they have different cost amounts. This scheme is particularly useful when you have a cost resource like lodging that applies to several tasks. You create just one cost resource, but you can assign it to the various tasks, and enter different cost amounts for each assignment. Then you can see the total cost information for the lodging resource, so you can tell how much your team is spending on those suites during business trips. Cost resources are a "fixed" type of resource cost, like the cost of equipment your people need, or one-time resource costs such as their travel expenses. Cost resources provide an easy way of applying miscellaneous or multiple costs to a task, like airfare and dining— in addition to the more commonly applied costs like people's salaries or per-use costs, such as consultant fees. Cost resources give you more control when you apply various types of costs to tasks. Cost resources are different from work and material resources in that cost resources represent costs commonly incurred to complete various tasks within a project. For example, if you had "Client Meeting" as a task within a project, you may want to create a cost resource (e.g. "Travel") to track the costs of travel associated with completing the client meeting task. Cost resources are used when you want to apply (to a single task) multiple separate miscellaneous costs that aren't changed by the amount of work performed on the task. For example, an executive working on a new project proposal might have three separate cost resources applied to him or her: one for airfare, one for food expenses, and one for hotel room expenses. In this way, several "fixed" costs can be applied to a single task. Unlike with work resources and material resources, cost rates cannot be applied to cost resources, such that cost resources have no default cost or pay rate associated with their creation. Unlike people or material resources, cost resources don't affect the schedule when they're assigned to tasks. Unlike work resources, cost resources cannot have a calendar applied to them; therefore, they do not affect the scheduling of the task. In Project Plan 365, you only enter the cost of the resource when it is assigned to a task in the project. If you add a work resource and a cost resource to the same task, updating the percent completes only updates the cost of the work resource. Note that there are often many tasks that do not require cost resources within a project file. 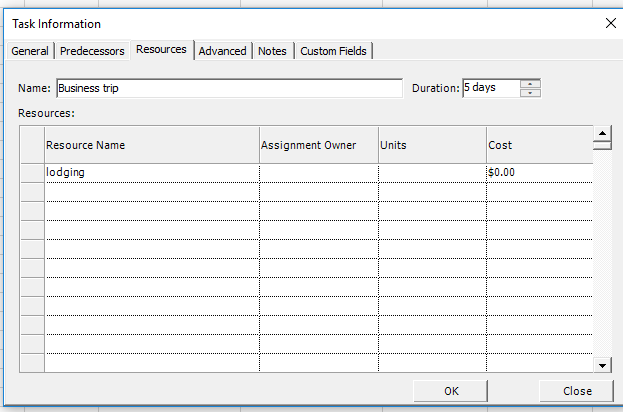 In Resource Sheet view, Project Plan 365 does not provide any editable cost cells for this type of resource. As you select Cost as type for a resource, most other columns from the Resource Sheet are inactivated. Material label, Max units, Standard (std.) Rate, Overtime (Ovt.) Rate, Cost/Use and Base Calendar have no value in the cost resource situation. Only Resource name, Type, Initials, Group, and Code are still editable. This is because the actual cost value of the cost resource isn’t set in this view, as the other costs are. The cost value for cost resources are set as you assign or apply this cost resource to a task. Keep one important thing in mind as you use cost resources: you can reuse the same cost resource. That is, if two tasks require two different plane trips and thus two different airfares, simply use one value for the cost resource as applied to one task, and a different value for the same cost resource as applied to the other task. It is advisable to not mix cost and work resources on the same task: be aware that when assigning a cost resource to a task, best practice dictates that cost resources should not be mixed with any other resources assigned to the task. This is because, if a cost and work resource are assigned to the task, and progress is used to track the task (i.e. marking it 100% complete), then Project Plan 365 will update progress for the work resource and not for the cost resource. Example: Let's assume that you want to have in your project a resource of type cost called lodging, that you can assign later on to different tasks. First you will need to enter this resource of type cost in your project. 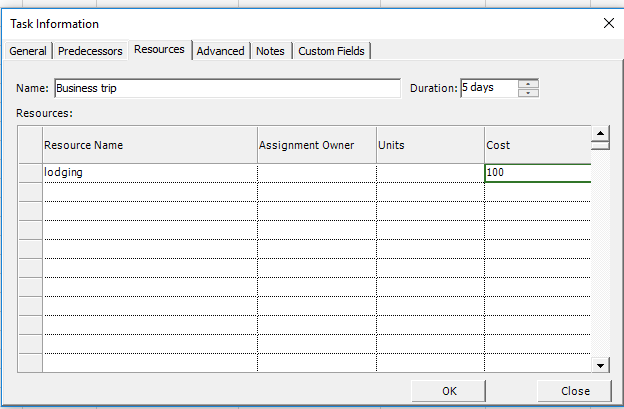 To enter a resource of type cost, switch to the Resource Sheet view. Be sure to have the Entry table applied in this view. In Resource Sheet there are two ways to indicate that a resource is of type cost. Place your mouse in the cell from the Type column to activate the drop-down list. 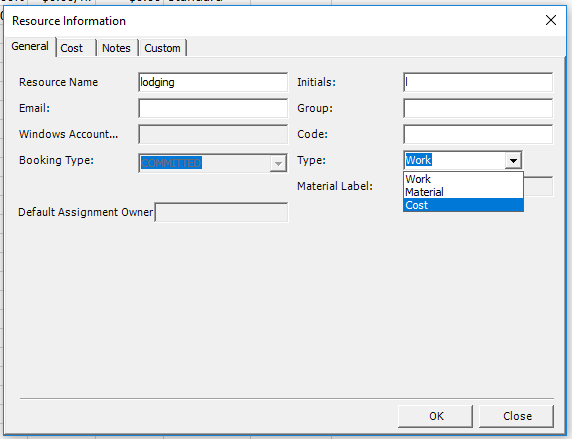 Press on the arrow displayed to the right in the cell and from the drop-down list select Cost, to specify that the entered resource is of type cost. Right-click on the resource and select Information.. from the opened contextual menu, or double-click on the resource name to bring up the Resource Information dialog. 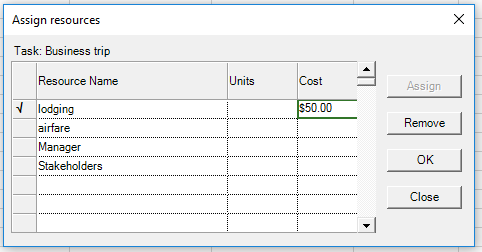 In the opened Resource Information dialog, on the General tab, select Cost in the Type list, and then click OK.
Once you've created a resource of type cost, you can edit a few fields about it, such as: the name of a cost resource, change its initials, specify a group, and enter a value in the code column. Please note that in case of a cost resource, most other columns from the Resource Sheet are inactivated, and cannot be edited. 1. In Gantt Chart view, click the task to which you want to assign the cost resource. 2. In the Resource Names column, click the arrow, and check the box next to the name of your cost resource. However, as in case of work resources, there are two other alternative ways of assigning a resource to a task. 1. In Gantt Chart view, right-click on the task to which the cost resource is assigned to, and pick Information, or double-click on the task name the bring up the Task Information dialog. 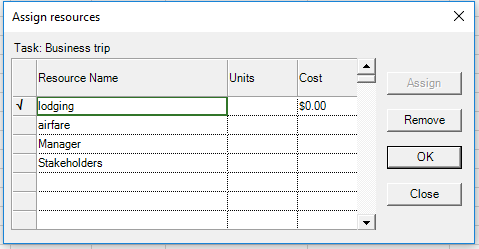 In Resources tab, notice that currently the displayed value for cost is 0. 2. In the opened Task Information dialog, go to the Resources tab, and enter a cost amount for your cost resource in the Cost field. Press OK in the dialog to save your changes. Likewise, you can specify the cost for a resource of type cost from the Assign resources dialog. After you added the lodging cost resource to several tasks in your project and specified cost values for each assignment, you can have a view of the expenses in your project associated with the lodging cost resource. To this end, switch to the Resource Usage view, and in the left side view apply the Cost table, which allows you to see the total cost of this resource.